The wind shifted in the night and I woke to a swarm of noseeums, tiny biting midges, crawling over my face. They chewed at my lips and slipped under my collar. I felt like I’d choke on them if I breathed too deep. They bit and I packed, wild, half mad, racing to the water. The wind pushed up waves that crashed and splattered across my deck. The boat rose and sank, barely moving, sliding backwards, fighting out of the open ocean and into a long, shallow bay. 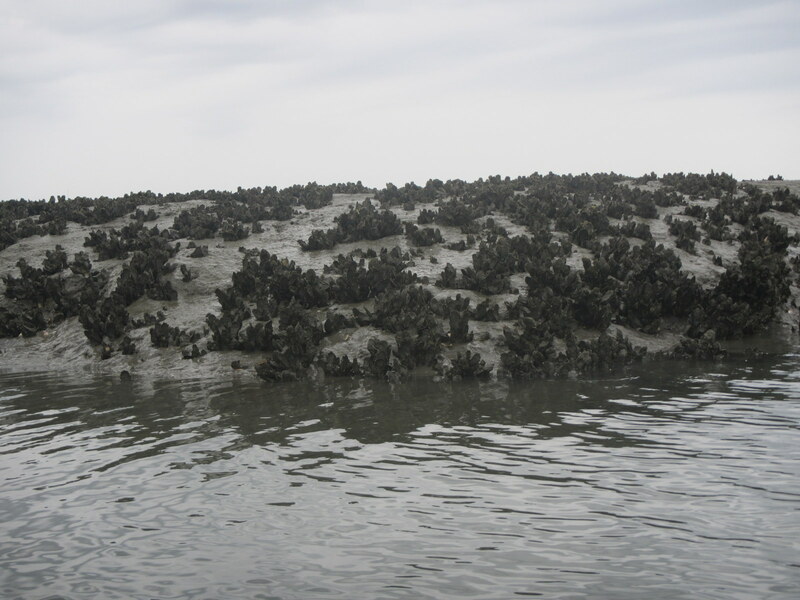 As the tide fell, oyster beds rose out of the water. The bay transformed into a labyrinth of channels that split and turned, dead ended, and looped back on themselves. The knife-edged shells hung on the banks like a wall of razor-wire. I guessed, backtracked, and scrapped through for hours, spilling out into a big, deep bay at sunset, just to stare across the wind-whipped waters in the purple light and know it was too far to cross, too big in the dark. I slunk around the shore as the light faded and rain fell. I saw the shadow of trees on a rise of marsh grass and crashed into the muddy bank of marsh grass. Water swirled around me, spilling into the boat as I jumped out and pulled, trying to escape the ocean as my feet sliced open on oyster shells. I limped and dragged the boat to the line of trees. The wind ripped into my soaked clothes and every movement to set up my tarp felt forced, every knot, every tangled line, everything. I crawled under it and into my hammock, beaten, soaked with sea water, bleeding, and lay still, collecting myself, grateful for a pocket of sanity in a vicious world. Posted in Angle to Key WestTagged Angle to Key West, gnats, noseeums, oysters, trouble, windBookmark the permalink. Easy to say, I know but it’s days like this that make the average days seem like heaven.